. Residential Roofing Companies in Houston Texas | Anchor Roofing Inc.
Tile material is one of the oldest material used in a roofing industry and is dating from the Ancient Chine. This material can last forever and that is the main reason for its popularity. Tile offers many interesting features that are recognized by many professional roofing companies around the world and in Houston, as well. The tile has an extensive range of concrete and terracotta roofing materials that offer a great solution for any kind of the weather conditions and suits any type of home and roofing located in Houston and Texas area. Clay tiles were made by hand until 1870. After that they are machine-made. The main tiles were impregnated with iron oxides so they can imitate the terra cotta style, wood, and even slate. Today, concrete and clay are mostly used to cover the roofing systems surface. Tiles have a feature that makes them easy to shape in any form. They can be flat undulated, and the shingles can also interlock and overlap on a surface of the roofing. There are many types, like the S tiles (with concave and convex troughs) and the barrel style (that is laid in vertical rows of half cycles). No matter on the shape, they are very decorative and have a big palette of colors available. Terracotta is a natural clay product that has been used for ages for the protection against the many natural elements. There are several types like Capri, Contour, French, Linea, Macquarie, Slimline and much more. These tiles are manufactured with the carefully selected clays that are baked at the temperature of 1100°C. The result is the strong and lightweight roofing material that has a great quality and durability. The color performance is achieved by the process called vitrification. Glaze and clay materials which are treated at the high temperatures are fusing and melting together and the result is a tile that is high resistant to UV exposure, fire, and other weather conditions. The modern concrete tiles are made from the cement and sand and have a pigmented coat in color. This is good for replicating the appearance of many tile designs and is very cost effective. They come in two categories, the flat concrete roof tiles, and the shaped concrete roof tiles. There are many types available, you can find them on the anchor webpage. Concrete tiles are made by a process called extrusion which gives the material the utmost density and strength. After the color and the process of molding, concrete gets a sealant finish which has a protective layer that helps against the efflorescence. This type looks like waves and is often used in the areas with rain. This material is similar to the Spanish tile which is turned upside down. The effect is that the surface is sharp, smooth and wide. A Double Roman may look like Spanish, due to its Mediterranean look. This type has a smaller watercourse. This material is made of concrete, clay or even terracotta. These are mostly made of concrete and are made to resemble any single style like wood shakes or even granulated asphalt. They do not have water courses, but their surface is flat and this way avoids the rain to stay on the surface. Their finish look is very attractive and that’s why is very popular. This material appears to look like the flattened S. It has a classic old appearance and samples to run off the water. This material is very light, not like the other similar materials. The true barrel tile is tapered and is wider at the end. They were shaped over the clay workers leg, and that look has kept until today. Today they are mass produced and often used on curved roofs due to their tapering shape. These tiles look like a reserved version of the Roman Double. This allows shedding the water away during a given time period. This material is a flattened Double Roman version. This material is popular due to its dramatic shading appearance. For all the help any questions about the tile roofing, contact us today. 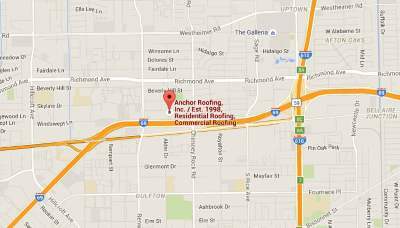 The Anchor roofing company will be there for you, your home and your TILE roof. Our contractors install, replace, and repair the tile roofing systems in the Houston, TX area, including Katy, Sugarland, Missouri, Pearland, Spring, Cypress, Galena Park, Richmond, Rosenberg, Stafford, The Woodlands, Baytown, Clear Lake, Galveston, La Marque, Pasadena, Deer Park, Sealy, La Porte, Brookshire, and Columbus.